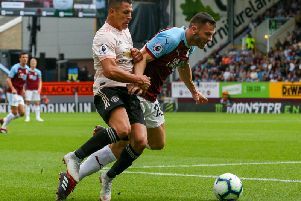 Burnley’s final pre-season game against newly-promoted Bundesliga side Hannover 96 has been abandoned on police advice after crowd trouble at Turf Moor. The Clarets were leading 1-0 at half-time after a 41st-minute header from Ben Mee from a Robbie Brady free kick, which came while visiting supporters surged towards the home end in the Cricket Field Stand, with seats being ripped up and thrown. After a long half-time break, a decision was made to call the game off to avoid any further trouble, due to "extreme risk" to the safety of supporters.